I really need to make a new button for this, but since I haven't had time to do this feature in...well months...I just never got around to it. However it's coming back! I'll have a new button next week. The Fanatic Report is a collection of all things happening on the blog from the week before and the week to come. It's also a bevy of random things I've found, things I think are cool, and the like. In other words, it's utter chaos. 2/28 - I reviewed The Midnight Tunnel: A Suzanna Snow Mystery by Angie Frazier. This book gets a solid 5/5 for me in the MG camp! Great mystery, precocious and witty protagonist, it's perfection. 3/1 - I reviewed The Betrayal by Sheila Hendrix. This book gets a 3/5, possibly closer to a 2/5. Although it was interesting enough, the plot was circular and I had a hard time connecting. 3/2 - I shared one of the reasons why despite pulling my hair out on a daily basis, I still work with kids. 3/3 - Sheila Hendrix stopped by with a guest post about Unconditional Love. 3/4 - Neesha Meminger, author of Jazz In Love, stopped by for a game of This or That? 3/5 - Double duty today! I interviewed Suzanna from The Midnight Tunnel and reviewed Like Mandarin by Kirsten Hubbard. LM gets a solid 5/5 people. AMAZING! 3/6 - GIVEAWAY TIME! Angie Frazier was sweet enough to offer up an ARC of The Midnight Tunnel to one lucky winner. GO ENTER! 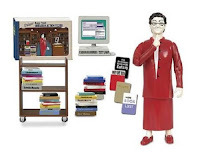 Yes my friends, this here is a genuine librarian action figure! Complete with books, a computer, and the stereotypical outfit. This little beauty can be yours at Amazon.com right now for the low low price of $12.45! Am I the only person who thinks this is utterly hilarious? * I've updated my blog design portfolio section so feel free to take a look! I'm scheduling new designs for the month so let me know if you're interested! * I realized that I am only 5 followers away from 700 on GFC! Thanks to all of you! You make me smile :). * I received a ton of books for review that I haven't had time to document or take pictures of, but THANK YOU! Especially to Harper Collins and to Kari Olson...the coolest friend ever. For once in my life...I have a WHOLE WEEK of nothing scheduled! I'll probably spend this week catching up on reviews of books I've read recently. You can definitely expect reviews of Dead Beautiful by Yvonne Wood, The Replacement by Brenna Yovanoff, and I Am J by Cris Beam.